HDTV Supplys WolfPack HDMI Over IP Network switch, together with the above optional HDMI extenders, operates as an HDMI Extender, HDMI Splitter and HDMI Matrix Switcher depending upon your needs. Because it is a matrix switcher, it allows any input to be routed to any output; or the same input to be routed to all outputs, or any combination. It is Browser Based WEB GUI controlled by a PC or MAC hardwired to its LAN port, or optionally, via the above add-on wireless Ethernet switch wired to the included 24-port Ethernet Switch. 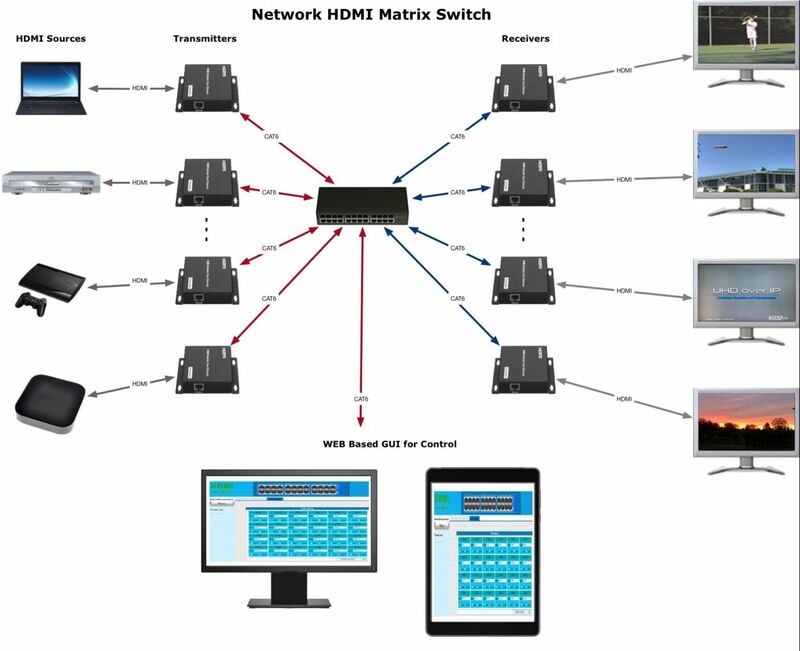 The above picture shows an example of a mixture of HDMI transmitters and HDMI receivers (totaling 16) & the Gigabit Ethernet matrix switch with internal firmware to support either an network HDMI splitter, network HDMI switcher or a network HDMI matrix switch. It uses CAT5e/6 cables and a Gigabit Ethernet LAN switch with MJPEG techniques and an industry standard IP protocol to deliver 1080p video from sources that are 300 feet away from the Ethernet switch and another 300 feet away to the TVs. It also allows the system to grow in the field as its design allows you the flexibility of adding more video sources or more displays to the system based upon the number of unused Ethernet ports available. NOTE: Included in the above price is HDTV Supplys 24-port Network Gigabit Ethernet matrix switch. If your application requires more than 24 ports please buy the above optional Ethernet splitter to add add′l TVs that show the same picture or call us at 800-841-9238. Why not buy this HDMI Over IP Network Switch today? Here is a video on Web Interface Setup. Q: Do you have any setup tips? Q: My customers are still having problems with the web interface, can you help. A: I talked to a customer that was having a similar issue accessing the switch and I found out he was having a IP conflict with the switch and his wireless network. For a quick test, turn your wireless OFF and see if your issue get resolved. A: No, it is controlled by a PC or a MAC only via its LAN port.